LOOK: Dead 58-foot-long fin whale (more photos) - Balita Boss! 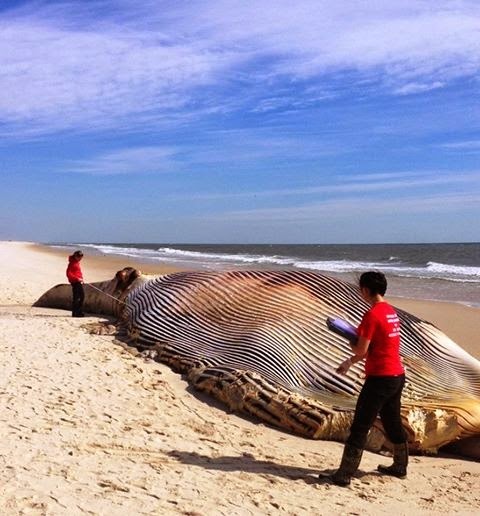 A dead 58-foot fin whale was discovered ashore Thursday morning near the campgrounds area at Smith Point County Park in Shirley, New York. Gothamist reports that the 58-foot fin whale was discovered about 8 a.m. on Thursday, October 9, about 77 miles from New York City. The whale has been described as a rare and endangered 50-foot finback whale. It's also the second-largest whale in the world, after the blue whale, growing to about 75 feet in the Northern Hemisphere. According to the report of Business Insider, Marine biologists at the Riverhead Foundation, performed a necropsy and reported at about 4 p.m. on Friday, October 10 that the whale was likely struck by a boat, adding that "Samples will be sent out for further analysis to confirm these preliminary findings." Post by The Riverhead Foundation for Marine Research and Preservation.